Season of Mist are proud to announce the signing of VLTIMAS. 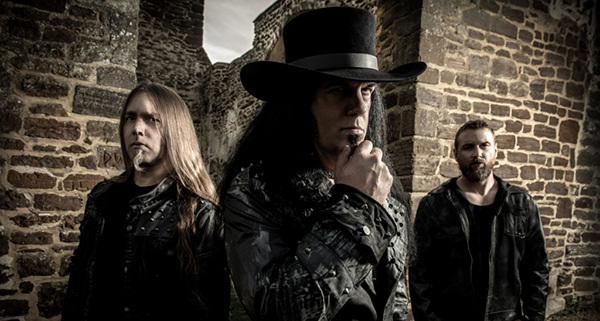 The three-piece extreme metal band, featuring David Vincent (ex-Morbid Angel, ex-Terrorizer), Rune 'Blasphemer' Eriksen (ex-Mayhem, Aura Noir, Earth Electric) and Flo Mounier (Cryptopsy), have completed their debut album with Jaime Gomez Arellano at Orgone Studio (Mayhem, Ghost) The trio's debut album will release in early 2019. Regarding the signing, Rune "Blasphemer" Eriksen comments: "Feels like aeons ago since I last ventured into these musical shores, but here we are. Its been an intense year and a half with lots of planning, hard work, personal sacrifice and traveling. I believe I speak for all 3 of us on this matter. Nevertheless, the beast has been summoned and recorded and I am overly confident about the outcome. Having had the opportunity to work with some of the finest of craftsmen in the genre, the level of experience speaks volumes. The mutual understanding, vision and drive, everything as if for a greater purpose. That's how the end result sounds to me. A special thank you goes out to longtime partner in crime Michael Berberian and Season Of Mist for the immense belief in this entity, as well as my companion Jaime Gomez Arellano over at Orgone Studio (UK) for a job superbly done! We are VLTIMAS." Flo mourner here to tell everyone that I am better drummer than Jay weinberg but his father has better posture than my father.